Stephanie is a certified Speech-Language Pathologist who earned a Bachelor’s Degree in Communication Sciences and Disorders, as well as a Master’s of Arts degree in Speech-Language Pathology from the University of Florida. While attending the University of Florida, Stephanie sought out an independent study at UF’s Center for Autism and Related Disabilities (CARD). This experience furthered her knowledge of working with children (and families) with Autism. Stephanie has extensive training on the Social Communication Emotional Regulation and Transactional Supports (SCERTS) model, a model aimed at building communication skills in children with Autism. Stephanie has experience working with children, ages 2 to 18, in the following areas: Articulation and Phonology, Fluency (Stuttering), Early Childhood Language Delays, Expressive and Receptive Language Delays and Disorders, Autism, Pragmatic Language (Social Skills) and Down Syndrome. Stephanie is a proud SLP! 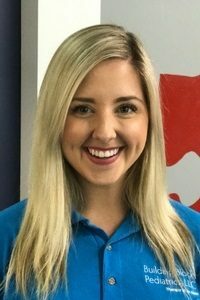 When she is not working, this native Floridian enjoys exploring Georgia’s many sights, volunteering with the Junior League of Atlanta’s and cheering on her beloved Florida Gators!